was premiered at the famed Radio City Music Hall in New York City. Initially, the studio considered a movie about the European fable, Reynard the Fox. 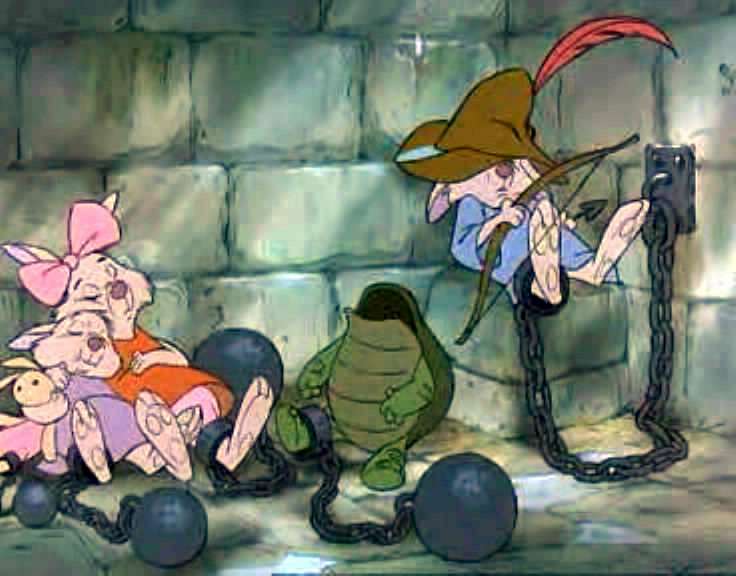 However, due to Walt Disney's concern that Reynard was an unsuitable choice for a hero, Ken Anderson used many elements from it in Robin Hood. Particularly the animal counterparts (e.g. Robin Hood, like Reynard was a fox and The Sheriff, like Isengrin was a wolf.) The Friar Tuck character initially was to be a pig but was changed to a badger to bring not a religious affront. Tommy Steele was the original choice to perform the voice of the title character, but he was dropped shortly after recording sessions began. Little John strongly resembles Baloo the Bear, only with brown skin, and interestingly enough, is voiced by Phil Harris in both movies. Sir Hiss resembles Kaa the Python almost to a tee, even having Kaa's hypnosis abilities incorporated into the Hiss character. The famous gap on Terry-Thomas' teeth was incorporated into the design of Sir Hiss character voice. The University of Southern California fight song, "Fight On," is played during the chase scene after the archery contest. Script 6 Sheriff of Nottingham: How about that? Sheriff of Nottingham: Oh, you got it all wrong, Hiss. The snivelin', grovelin' weaselly, measly... Prince John: Enough! Sheriff of Nottingham: But, sire, it's a big hit. The whole village is singin' it. Prince John: Oh, they are, are they? Well, they'll be singing a different tune. Double the taxes! Triple the taxes! Squeeze every last drop out of those insolent, musical peasants. Alan-a-Dale: Man, oh, man. Prince John sure made good his threat. And his helpless subjects paid dearly for his humiliation, believe me. Taxes, taxes, taxes. Why, he taxed the heart and soul out of the poor people of Nottingham. And if you couldn't pay your taxes, you went to jail. Yep, I'm in here too. Nottingham was in deep trouble. Father Sexton: Friar Tuck...I don't think anyone is coming. Friar Tuck: You're right, Sexton, but maybe the sound of this church bell will bring those poor people some comfort. We must do what we can to keep their hopes alive. Mother Church: Oh, how can there be any hope with that tyrant Prince John taxing the heart and soul out of the poor people? Friar Tuck: Yes, those poor people. Look, our poor box is like our church... empty. Mother Church: Friar Tuck, we've saved this. It's not much, but please take it for the poor. Friar Tuck: Your last farthing? Aw, little sister, no one can give more than that. Bless you both. Father Sexton: Oh, we were just saving it for a rainy day. 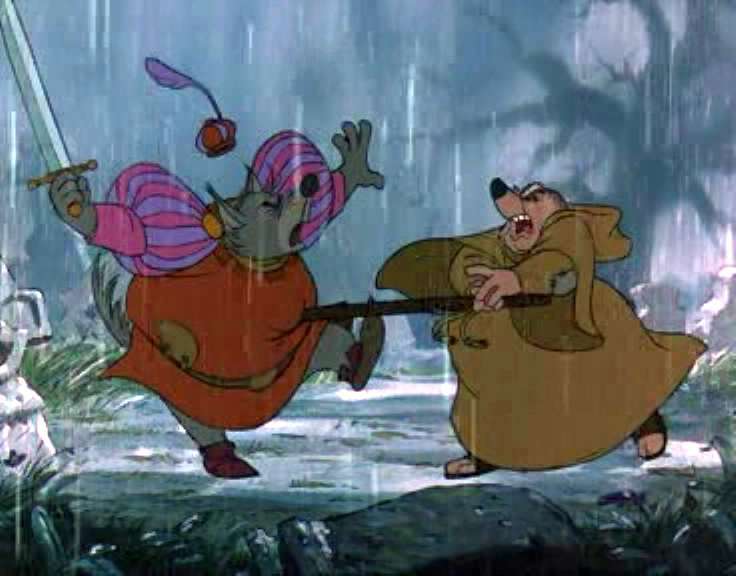 Friar Tuck: Well, it's rainin' now. Things can't get worse. Sheriff of Nottingham: Howdy, Friar. Well, it looks like I dropped by just in time. Father Sexton: What does that big-bellied bully want? Mother Church: Father, shh. Sheriff of Nottingham: Hmm. Well, what have we got here? Friar Tuck: Now, just a minute, sheriff! That's the poor box! Sheriff of Nottingham: It sure is, and I'll just take it for poor Prince John. Every little bit helps. Mother Church: Oh, you put that back! Sheriff of Nottingham: And His Majesty also blesses you, little sister. Friar Tuck: You thievin' scoundrel! Sheriff of Nottingham: Now, take it easy, Friar. I'm just doin' my duty. Friar Tuck: Collectin' taxes for that arrogant, greedy, ruthless, no-good Prince John? Sheriff of Nottingham: Listen, Friar, you're mighty preachy, and you're gonna preach your neck right into a hangman's noose. Friar Tuck: Get out of my church! Out! You want taxes? I'll give you taxes! Father Sexton: Give it to him! Give it to him, Friar! Sheriff of Nottingham: You're under arrest for high treason to the crown. Mother Church: Oh, no! Father Sexton: Oh, there, there, Mother. Sir Hiss: Sire, if I may... May venture an opinion, you're not your usual cheerful, genial self today. I know. I know. You haven't counted your money for days, hmm? It always makes you so happy. Sire, taxes are pouring in, the jail is full. And, oh, I have good news, sire. Friar Tuck is in jail. Prince John: Friar Tuck? It's Robin Hood I want, you idiot! I'd give all my gold if I could just get my hands on... Did you say Friar Tuck? Sir Hiss: Did I? Yes, I did. Prince John: Ah! Hiss, I have it! I'll use that fat friar as bait to trap Robin Hood. Sir Hiss: Another trap? 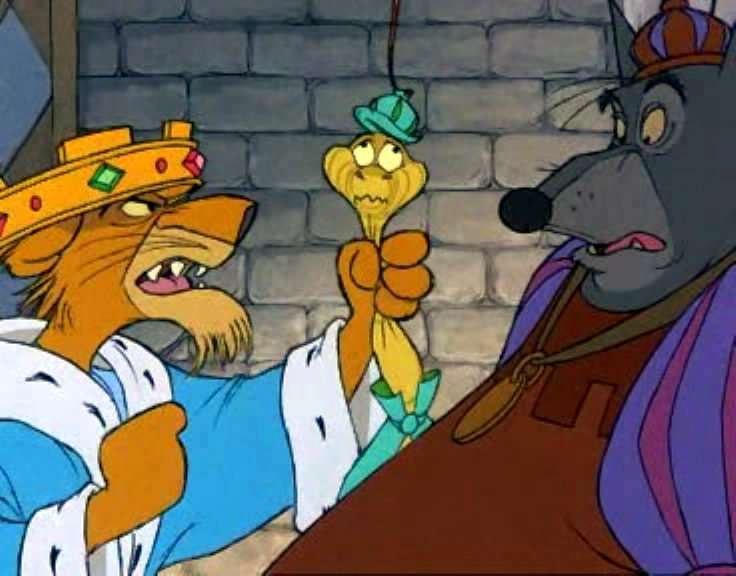 Prince John: Yes, yes, you stupid serpent. Friar Tuck will be led to the gallows in the village square, don't you see? Sir Hiss: But, sire, hang Friar Tuck? A man of the church? Prince John: Yes, my reluctant reptile. And when our elusive hero tries to rescue the corpulent cleric... my men will be ready. Ha-ha! Nutsy: Well, Trigger, everything's rigged up and all set. Trigger: Yep, it's one of the prettiest scaffolds you ever built. Nutsy: Sheriff, don't you reckon we oughta give that there trapdoor a test? Sheriff of Nottingham: Now I know why your mama called you Nutsy. Robin Hood: Alms. Alms for the poor. Do me old ears hear the melodious voice of the sheriff? Sheriff of Nottingham: That's right, old man. Robin Hood: What be going on here? Sheriff of Nottingham: We're gonna hang Friar Tuck. Robin Hood: No! Hang Friar... Um, hang Friar Tuck?